We raise spaghetti squash in our garden, and I enjoy coming up with different ways to use it. 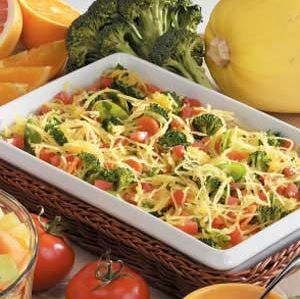 We like the colorful mix of tomatoes, carrot, broccoli and snow peas in this microwave dish. FREEZE: Freeze leftovers. To reheat, place in a microwave safe dish and heat 4-8 minutes until hot. Top with more parmesan cheese, if desired. Cut squash in half lengthwise, discard seeds. Place squash cut side down in a microwave-safe dish or plate. Microwave, uncovered, on high for 10-12 minutes or until tender. Cool. Meanwhile, combine the tomatoes, oil and garlic in a microwave-safe bowl. Heat, uncovered, on high for 1-2 minutes or until tomatoes are softened, stirring once. Stir in the basil, salt and pepper. Place broccoli, carrot and water in another microwave-safe bowl. Cover and microwave on high for 1-1/2 minutes. Add peas; cover and cook 1-2 minutes longer or until vegetables are tender. Let stand for 5 minutes; drain. Add to tomato mixture. When squash is cool enough to handle, use a fork to separate strands; toss with tomato mixture. Serve with Parmesan cheese. Yield: 5 servings.